Ghosted, the word, is when a hookup quietly ignores your texts, calls, emails and other online communications. 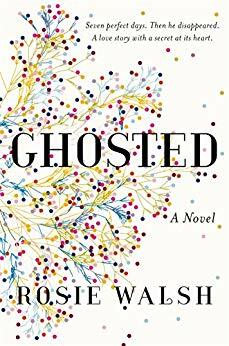 Ghosted, the book, is a wonderful twisty love story. Sarah and Eddie, both in their late 30s, spend a romantic week together after meeting unexpectedly. As Eddie is leaving for a holiday in Spain, both vow to meet up again after his return. However, Sarah hears nothing. Her increasingly frantic texts, calls, Facebook messages and emails go unanswered. Her best friends tell her to move on. But Sarah is convinced something tragic has happened to Eddie and just can’t let go. Ghosted is a delightful summer beach read for mystery lovers. The story of the romance evolving, told in flashbacks, is just as entrancing as the mystery of Eddie’s disappearance. Also, Smelly has to be the best, and probably the most accurate, name for a dog either in fiction or in real life. 4 stars!